Capt. Wm. G. Voller, Acting Ex Off, 2d Bn. The 2d Bn, 60th lnfantry passed through the city of Eupen, Belgium, arriving in an assembly area two miles south of the town for the night. No enemy were encountered. The mission of the 60th Infantry Regiment, less the 1st Battalion, was to follow in division reserve. The 39th and 47th Infantries were on the line, and the 2d Battalion, 60th Infantry (less F Company) followed the 3rd Battalion. The regiment arrived in the afternoon at an assembly area five miles southeast of Roetgen (vic 938233). It left the vicinity of Eupen at 1045 and arrived in the afternoon at this assembly area, where it stayed for the night. In the afternoon the 2d Battalion followed the 3rd Battalion towards the town of Mützenich (9219) just west of Monschau (9418). The 3rd Battalion had taken most of Monschau, and late in the afternoon the 2d Battalion moved into the town without contacting the enemy. The battalion remained in Monschau, while the 3d Bn took part in the capture of Höfen (9516). 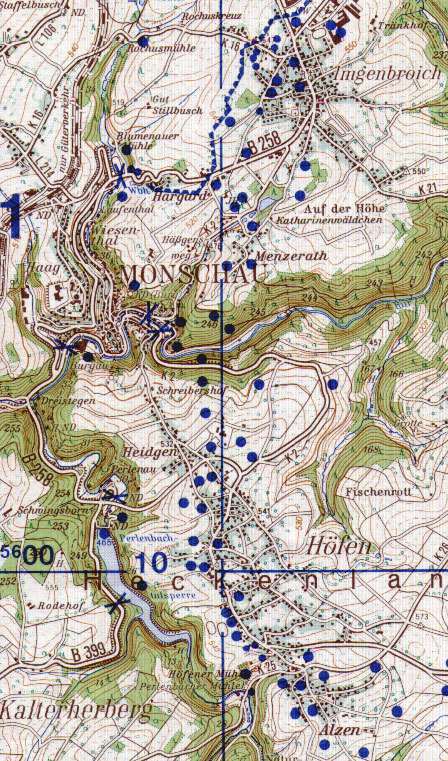 The supply route from Monschau to Höfen was invested with sniper and pillbox fire on the eastern side. E Company therefore moved out at 0800 to take pillboxes east of the road. G Co spotted an enemy AT gun beyond a blown bridge (942197), while the pillboxes were in the vicinity of (9518). At night the AT gun pulled into position to catch the vehicles going along the road, but it was spotted before it could fire. E Company had been informed that they would meet only snipers along the route, but instead they found the pillboxes reoccupied. They therefore had to clear them to open up the route south to the 3rd Battalion. The company caught mortar and machine gun fire in the action. It had no heavy weapons and had to maneuver up to the pillboxes. By threatening in one case to pour oil over the pillbox and set it on fire, the company secured the surrender of one pillbox. Approximately 50 prisoners were taken from the area. The rest of the battalion was not engaged. At 0550 in the morning, E Company received an enemy counterattack. It came from the left flank (northeast), and in the foggy weather the enemy slipped up, surrounded, and captured one officer and 28 men at pillbox (948181). A sharp fire fight took place before the enemy occupied the position. After E Company reorganized, it retook the pillbox at 0945, and the situation quieted down. Meanwhile the rest of the battalion (less F Company which was on a detached mission manning road blocks farther north) remained in Monschau. Some enemy artillery fire was received. The 2d Battalion was detached from the 60th Infantry and attached to the 39th, with the mission of holding Monschau against enemy action. F Company returned to the battalion. Its defensive position was E Company along the road to the south towards Höfen, G	Company on the north (945195) commanding the approach to the town from that direction, and F Company in the town itself as reserve. At 1945 orders were given and then cancelled for an attack on Imgenbroich (9520). It was considered impossible in view of the lack of flank support. The companies continued to hold their positions. At 0945, G Company was ordered to do some probing in a northeastern a direction towards Imgenbroich. The company moved along the road from Monschau towards Imgenbroich, up the rise in the terrain east of Monschau until it could see the Dragons Teeth north and east. It received some machine gun and mortar fire, but no casualties were suffered. It reached this position (948196) by 1115. At 1600 the battalion was detached from the 39th Infantry and made part of Task Force Tincher (B Co, 899th TD Bn less one plat, less one sect, Rcn Co, 899th TD Bn, less two platoons, 9th TRC Tp, Plus D Co, 746th Tk Bn less one platoon, 2d Bn, 60th Inf. one bttry, 34th FA Bn, one bttry, 60th FA Bn, and one squad, A Co, 15th Eng Bn. At 1630 one platoon of F Company was sent to the vicinity of (9031 ?) to outpost an artillery position (an OP). It was expected that it would have a fight, but it reached the position at 1900 without opposition. The rest of the battalion regained in Monschau. One platoon of F Company attacked at 0700 to take four pillboxes, which run in a line approximately 1000 yards east of Monschau and the road to Höfen. They found two other emplacements not indicated on the map and had to take those out as well. The first pillbox was not heavily defended, and the platoon received some small arms and mortar fire in overrunning it. At 1023 F Company platoon reported that it was going to the next one, which fell after some resistance. An anti-personnel mine wounded five men and killed an officer. The third had a heavy underbrush around it and was located in a draw (948162). It proved difficulty, but finally seven prisoners were taken and the enemy outside chased away with small arms and grenade fire. The last pillbox was on the bank on the opposite side of the draw. Fire from a 155 mm gun had uncovered the excellent camouflage. This was also cleared. At 1930 a quarter ton truck, taking prisoners to the rear, was shot at by snipers, who then captured the interrogator and freed the prisoners. The rest of the battalion remained at Monschau. At 1440 the enemy attempted to infiltrate into a position of F Company on the north, but they were driven off by small arms fire. The 1st platoon continued its defensive position along the pillboxes southeast of Monschau. At 1555 E Company, which was still holding along the Monschau-Höfen road by a system of strong points and machine gun positions, got enemy artillery and mortar fire. At 2115 the enemy began to shell G Company north of the town. Its two platoons were east of the Monschau-Mützenich road, while one was on the west. No other activity. At 1800 enemy in small groups of four to eight began to advance across the high ground towards E Company (at 951183).This did not develop into an attack, however. By this time the platoon of F Company had blown the pillboxes and retired to Monschau. Enemy patrols were occasionally active to the east of the town. At 0800 E Company made a feint, a demonstration, while the 39th Infantry attacked near Lammersdorf. At 1215, the enemy shelled the OP and lines of E Company heavily. The rest of the day was quiet. At 0200, a small enemy patrol tried to infiltrate into the right flank of E Company but was driven out by BAR fire. Word received that the battalion would be relieved. At 1135 the relief of E Company and part of G Company begun by the 24th Cavalry Squadron. These elements entrucked at 1715 to join the rest of the regiment two kilometers southeast of Zweifall (976354). At this point G Company relieved C Company. The rest of the battalion was relieved and moved to join the regiment in the vicinity of Zweifall. G Company in position at (992328) was flanked on the left by F Company, beyond which was E Company. By 1530 the entire battalion was in this position, enemy activity consisted of occasionally artillery shelling. No active operations were undertaken. At 1440, however, the plan for the coming attack was received. Three objectives were designated for the regiment: Obj "A", the RJ at Richelskaul (019325), Obj "B" the next RJ to the south (011305), and Obj "C", the CR and high ground farther west (003313). The 2d Bn was to attack toward Obj "A", leave there a holding force and attack to Obj "B", where it would consolidate its position. Artillery preparations were planned on enemy strong points. At 1415, enemy planes strafed and dropped a few light bombs. At 0700, the battalion was prepared for the attack, but it was postponed due to poor visibility. At 0800 the battalion was prepared for the attack. At 1010 the planes came over and bombed their targets. The artillery preparation began at 1120, consisting of three minutes of shelling with a five minute intermission followed by two more minutes. At 1125 the battalion began to move forward. From the very start it met stiff enemy resistance, consisting of small arms, machine gun, and mortar fire. The enemy thus encountered was at (998330). Casualties were heavy from the beginning. By the end of this operation, there were 107 casualties	and 5 officer casualties -- this did not include number killed or missing but only wounded. G and F companies were on the line, with E in reserve. H Company machine guns were with the other companies, while the mortars were kept under battalion control. F Company on the left moved in a column of platoons, as did G Company on the right F reached (008331) by evening, while G Company got to (001328). The area through which the advance was made was hilly and thickly wooded. This made the enemy artillery effective as tree bursts and cause observation to be very difficult. Fileds of fire in the tradltional sense were non-existant. lt was impossible to get armor support. The battalion held in the same position as the previous evening, while at 0755 it made a demonstration to assist the 1st Bn in its attack around to the north (this represented a modification of the original plan in that the 2d Bn would no longer go to Obj A.) At 1045 friendly planes strafed and bomded the area to the front. At 1800, G Company moved up to tie into E Company, which in the moving had been committed in the middle of the battalion position. Thus G was on the right and somewhat to the rear (001328), with E at (005330), and F to the east of it. The enemy infantry remained in close contact and also flred his mortars and artillery. Before 0900 the enemy laid in a terrific mortar and artillery barrage. He then counterattacked in the sector of the 1st Bn, with some of the force felt on the left sector of the 2d Bn. However, the attack was repulsed. At 0900, E and F companies started to push forward, to the east, during which time they received and repulsed local counterattacks. However, shortly after they attacked the two companies changed their direction to the south, and moved with the ol grid line between them. By evening, F Company on the left flank was at (010324), and in contact with the 1st Bn to the east by means of patrols. E Company was abreast and to the west of F Company. 66 replacements were received during the day. At 0700 the two companies renewed the attack, and each time they moved they would get counterattacks of infantry, mortar and artillery fire. The movement was therefore slow, as they continued south, skirting a field (not on map) on the western edge. Two platoons of G Company were moved up on the west flank of E Company. The enemy resistance continued to be stiff, with his artillery shelling particularly hazardous in view of the thick trees. For the night F Company was at (012324), E immediately to the west, and the 2 platoons of G Company on the right flank. The battalion held relatively the same position during the day. At 1000 E and F companies attacked in a southwestern direction towards Objective "C". G Company held the area as reserve. The enemy resistance was moderate. E Company, which now had two tanks with it, secured a good many prisoners. The tanks tried to move directly south, but the terrain was too wooded and wet, so they retraced the route and out east to the road (at 001324), where they turned south to join the company at the sharp bend (005320) at about 1800. F Company still remained on the left, and tied into the road, with E to the west, and G echeloned to the rear. The battalion took a total of 60 prisoners during the day. Early in the morning the battalion prepared itself for further attack to the south, but the movement did not begin until about 1100. The companies were immediately hit by an strong enemy counterattack on the right flank of E Company and on the front of G Company. There was lots of machine gun and semiautomatic weapons used by the enemy, who at no time was more than 100 yards distant. The attack came from the southwest, and was entire infantry without heavy armor. The enemy used lots of mortars. The effort was finally repulsed by 1300, primarily by mortar and artillery fire. The battalion then spent the rest of the day in straightening out its lines. The tanks moved from their position at (001324) farther south to set up a road block for F Company along the road. The attack was renewed at 0930. The objective remained the crossroad (Obj "C"). F Company had three tanks and moved down the fire break, with its left flank guiding on the break and one platoon with the engineer platoon going down the road on the left. E Company on the right of the zone moved through the heavy pine woods, fighting stiff enemy infantry opposition. It used not only its small arms, but lots of mortars and artillery, as well as tank fire when possible. E Company faced a particular stubborn point (vicinity of 002315). G Company followed closely on E Company, and the mortars supported from (995320). E cross the road just west of the RJ, and moved south to secure another pillbox late in the afternoon. Two additional one were found and taken. F Company crossed near the junction also, but it pulled back to the northwest to give protection in that direction. The enemy was clearly disintegrating, for elements of 18 different companies were found in the 158 prisoners taken during the day. Among the enemy were air corps, engineers, and a few SS troops. The companies tied in on the objective for the night. E Company moved out to secure all of the pillboxes in the objective area. One squad of G went southwest of the fire break and tied in with E and F companies, while F Company consolidated its position south of the road. Eventually, F Company took over Objective B from the 3d Battalion, and held that position. The only enemy activity was artillery shelling. Battalion relieved from its position on these two objectives.